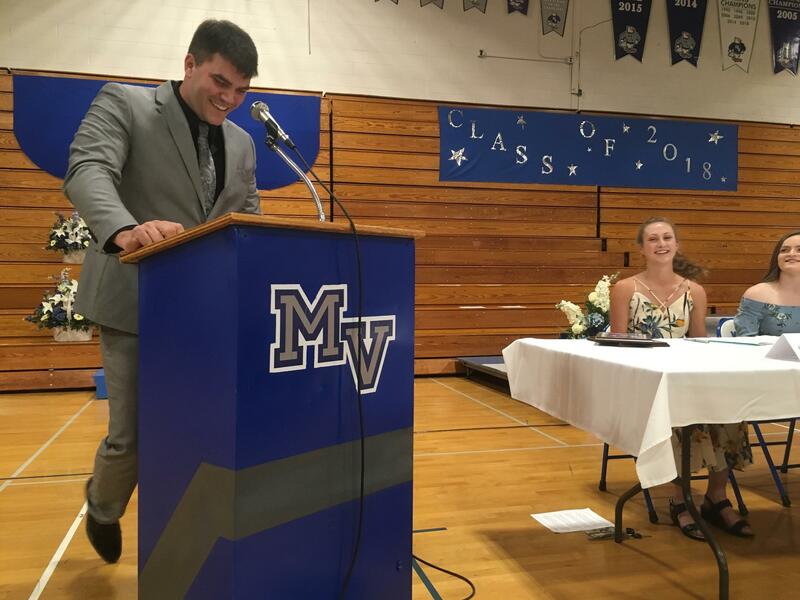 Mountain Valley High School math teacher Jeffrey Pelletier presents senior Brooke Carver with a math award at the school's senior banquet. Last week was one of celebration at Mountain Valley High School in Rumford. Over a dinner of pasta and chicken, the seniors received awards and scholarships. Many say that senior Brooke Carver is the star of the evening. “She's been a great asset to our school and community, and will no doubt be successful in all her pursuits," teacher Jeffrey Pelletier announced as he presents her with a math award. Carver also received awards for community service and English. She played sports year-round, and her accomplishments earned her admission to Bentley University, near Boston, this fall. "She's been a great asset to our school and community, and will no doubt be successful in all her pursuits," teacher Jeffrey Pelletier announced as he presents her with a math award. Carver will be leaving a town that has struggled. The Rumford area used to be a hub for pulp and paper. In the 1950s and 1960s, it reached a population of more than 10,000 residents. But automation and a declining paper industry have prompted round after round of layoffs to the Rumford Mill. The downtown is now dotted by vacant buildings and storefronts. Over the last decade, Mountain Valley High School has lost more than one-third of its students. Nearly 70 percent of those remaining are eligible for free or reduced-price lunch. Principal Matt Gilbert says the increasing economic hardship has had a noticeable effect on students' college aspirations. Only a few students, he says, look at colleges beyond Maine. "Not quite so much the out-of-state schools," Gilbert says. "I think that's connected to our students' demographics. What's happening at the dinner table when they get home." Chris Carver is a social studies teacher at Mountain Valley High School. He's also Brooke Carver's dad. Gathered inside his classroom with his wife, Debbie, and two kids, Carver says it has been frustrating that more of his students can't attend those prestigious schools, even though he knows many have the grades and work ethic to succeed. "I don't think there's anything wrong with that. I went to [the University of Maine Farmington], and I am very happy I did," Carver says. "I do, though, want to keep the door open for any kid that goes here to be able to go anywhere. And I do wish we had more resources to enable that to happen." "And even if you do get in to one of those schools, you have a lot of catching up to do," says Chris Carver’s son, Garrett. Garrett Carver graduated five years ago and attended Bowdoin College in Brunswick. His university experience also highlights the additional college barriers for students from rural Maine. Garrett says when he arrived at Bowdoin, he was already academically behind classmates who had access to advanced placement courses in high school. "Even for me, everyone had taken AP Chem, AP Bio, usually AP Physics," he says. "It's like, we didn't even have those choices here." And his mom, Debbie Carver, recalls the culture shock her son experienced. "I mean, you have friends that have houses in foreign countries," Debbie Carver chimes in. "They're like, 'We have a place in the Bahamas.' We're like, 'The Bahamas?' They're like, 'It's not that nice.' And we're like, 'You have a place in The Bahamas!' That's just nothing that we experience here." 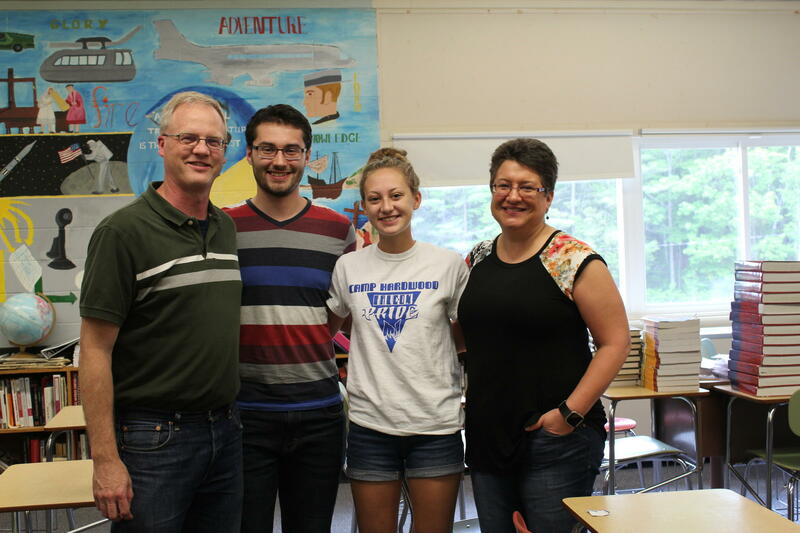 Teachers Chris and Deborah Carver pose with their two children, Brooke and Garrett, inside of a classroom at Mountain Valley High School in Rumford, Maine. But Garrett succeeded. He enjoyed college. He received a degree in computer science and is now working in the greater Portland area. Principal Matt Gilbert says he sees those success stories every year and is proud of them. But he'd like to see more of those success stories return to Rumford. “To also draw them back, with their careers. With their ambitions. With their experiences," he says. "If we can figure that out, I think it'll be a Renaissance for Rumford, Maine. We're in need of that." For some graduating seniors, the idea of returning to Rumford is appealing. Senior Isaiah Thornton grew up in the middle of the woods about a dozen miles outside of town. He spent weekends in his grandfather's barn, tinkering with old cars and motors. But college wasn't on Thornton's radar until a few years ago. “My mom didn't go to college, my dad didn't go to college," he says. "And when they did talk about that, they talked about me going. And me being the first in my family to go." Over the past two years, Thornton says he got his grades up and filled out applications and financial aid. Now he's enrolled in the automotive program at nearby Central Maine Community College. "With that, I want to bring business to Rumford," he says. "I want to open up my own shop. I want people to say, 'Wow. Look at this work. I want to go there.' I just want to give back to Rumford, in a way." Town and school officials are searching for new ways to attract students like Isaiah Thornton and Brooke Carver. Gilbert offers an example of a new ski patrol apprenticeship program at nearby Black Mountain, which he hopes will expose students to outdoor careers only a few miles away. Many of the students interviewed for this story said they would be interested in returning to their hometown at some point, if the right job opportunities were here to greet them. Right now, though, Rumford's economy, like many in rural Maine, is still grappling with long-standing problems that have made it difficult to bring those jobs back.